dis·rup·tive tech·nol·o·gy: "a new technology that unexpectedly displaces an established technology by providing substantially new or improved functionality or similar functionality at a significantly lower cost." Officially known as the i1 Display Pro III, by any definition X-Rite’s new Display 3 colorimeter is a disruptive technology. In many ways, it is not useful to think of the Display 3 as simply a successor to the Display 2, which has been the dominant affordable colorimeter on the market for several years. The Display 3 is based on a completely different design and offers a level of performance profoundly superior to the Display 2, indeed profoundly superior to any colorimeter at anywhere near the MSRP price of $269. The filters are completely new and are less likely to deteriorate as a result of exposure to environmental factors. In addition to this, the Display 3 also includes a built-in hinged diffuser that swings in and out of place easily for measuring illuminance directly from a front projector’s lens. Unlike previous products, this diffuser is color neutral allowing for accurate readings in illuminance mode. Off screen readings are still the preferred method for measuring front projectors, but at least one can now measure from the lens without having to color correct the results. I have had a Display 3 on hand for some time for testing, and I have been nothing short of amazed at the level of performance it provides at its price point. Despite the fact that this colorimeter is a successor to the Display 2, it so vastly outperforms the Display 2 that a better comparison is probably the Chroma 5. To test the Display 3’s speed, I used it for a complete auto-calibration run in ChromaPure. The process took 7½ minutes to complete. The Chroma 5 clocks in at 23½ minutes. This indicates that the Display 3 is about three times faster than the Chroma 5. To confirm this, I ran both through a full grayscale run. See the video below, which confirms the auto-calibration findings. This meter is very fast. Another area in which the Display 3 excels is low-light sensitivity. The Chroma 5 is rated down to 0.01 cd/m2 and this seems about right. However, the Display 3 will read light that is one-third as bright. To test this I used the AccuPel DVG-5000 video test pattern generator to feed increasing lower intensity signals to a Pioneer Kuro, the champ of low black-level displays. The results of this test confirm that the Display 3 reads down to 0.003 cd/m2, or 0.001 ft-L.
See this new test of the i1 Display Pro's low-light sensitivity that uses greater precision. One of the most important aspects of a colorimeter's performance is its ability to return stable and consistent readings, especially at low light levels. We worked very hard to implement support for the Display 3 in such a way that ensures this. Here’s the Display 3 reading a 30%, 20%, and finally a 10% stimulus test pattern off of the screen from a front projector. As you can see in the video below, the consistency of the Display 3’s readings, even at very low light levels, is exemplary. This performance parameter can only be finally determined after sampling a large number units. Often, the biggest variable in a meter's color accuracy is the unit-to-unit variation resulting from mass manufacturing with affordable materials. I can say that the production units I have tested are excellent in this regard. The Display 3 shows errors no higher than xy0.006 for both color and white relative to a $10,000 reference spectroradiometer. This is performance comparable to a stock Chroma 5. It will take time before we can determine how well the accuracy holds up over time. I believe that because the Display 3 provides new-generation filters installed in a sealed container it will age more gracefully than either the Display 2 or Chroma 5. However, as with any filter-based device it will always benefit from calibration against a reference spectroradiometer. 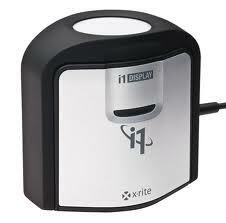 The X-Rite Display 3 is a truly revolutionary product. It offers near professional performance at a price affordable to any enthusiast. In fact, its performance is so close to professional colorimeters, such as the Klein K-10 or X-Rite’s own Hubble, than it has become extremely difficult to justify purchasing such devices that come in at 10-20 times the cost of the Display 3. The Display is not perfect. At low light levels, its otherwise blazing speed slows down considerably. Also, I would really have liked to see some type of aiming device, similar to the laser on the Hubble. However, this would have no doubt increased the cost of the unit. The color analyzer is often the weakest link in measuring and adjusting a display device. Because of the unprecedented price/performance ratio of the Display 3, I would argue that it is among the most important products ever developed for display calibration.